The final decades of the Soviet Union are widely referred to as "The Era of Stagnation," and yet this period also produced some of the most innovative Soviet architecture since the heady avant-garde days of the Revolution. Victor Jorbenadze's 1985 Palace of Rituals in Tbilisi is an outstanding example of the genre: extravagant and otherworldly, its swirling facade might be fresh in from Las Vegas, if not from the cover of Galaxy Science Fiction. The Palace embodies not only an aesthetic paradox, but a cultural one: a cathedral in an atheist land, a lavish commission in a decade of economic torpor, and a dynamic synthesis of local and international influences from behind the Iron Curtain. These seeming contradictions oblige us to rethink the Soviet experience, postmodernism as both a style and cultural condition, and the assumed binary between preserving old buildings and designing new ones. Amid Leonid Brezhnev's new ideology of “developed socialism,” late Soviet architects, in ways both unexpected and underappreciated, engaged with a nascent preservation sensibility within the Soviet Union. In a dramatic departure from the modernist aesthetics of the 1960s, which deliberately ignored local vernacular traditions, architects like Jorbenadze explored designs “national in form” (sensitive to local historic fabric) but also “socialist in content” (reflective of Soviet values). 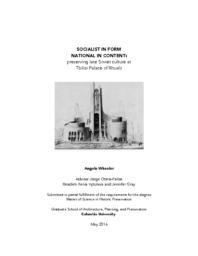 The result was a dynamic, historically-inflected postmodern architecture that emerged from the cultural logic of late socialism. Today, however, the very buildings intended to celebrate Georgian heritage face their own preservation threat: they do not satisfy Georgia's new national narrative, which prefers to idealize a pre-Soviet past or trumpet a post-Soviet future. Too young to be recognized for their historic value and tainted by association with the "Soviet Empire," late Soviet architecture faces decay, demolition, or ham-fisted modification. Not only are the buildings dismissed, but so is their approach to design, which balanced bold innovation with sensitivity to local tradition. Contemporary Georgian architects, public officials, and planners have reverted to a binary: constructing either pastiche historic architecture, or new designs no more attentive to local fabric than the reviled Soviet mass housing they replace. By preserving the legacy of late Soviet architecture, we preserve an alternative to these two extremes, which stands to benefit architecture new and old in Georgia.